It’s the HARDEST part about preparing curriculum to teach healthy cooking classes to kids. It’s not a breakfast, lunch or dinner. I’ve found creative ways to get around it, like kid-friendly tiramisu. Most desserts of ours involve a pancake of some sort, but when we were planning the Food Network Favorites theme for this Fall I realized we had NEVER done a rice-krispy treat. Check out the link below to see my video tutorial and the recipe. 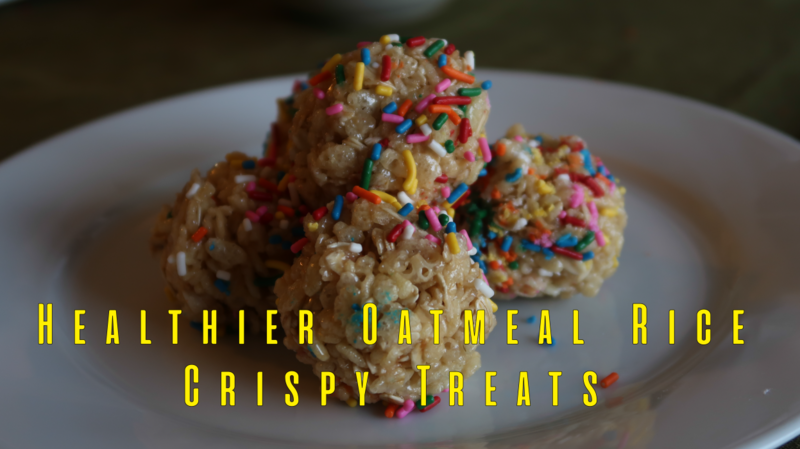 It’s easy, fun to make with kids and a true crowd pleaser. Add 1 Tbs butter and use it to grease a large bowl. In a large pan over medium-heat, add 4 Tbs butter and melt. Stir in the marshmallows until they’re melted, about 5-7 minutes. Turn of the heat, then add the oats, salt and cereal to the pan and mix until combined. Remove to the large bowl to cool. Chop the strawberries, bananas and apples and add to a bowl to make your fruit salad. Wet your hands with water and form the rice crispy mixture into small balls. Decorate with sprinkles and let cool. Serve with fruit salad and enjoy.